Are there statistics that collect information about the cash flow of sports clubs? What I am wondering is, in general do the team owners have to spend money to manage the club, for passion (I hope), or can they earn money from this activity as a job or an "financial investment"? There are similar questions that has been brought up on other sites. 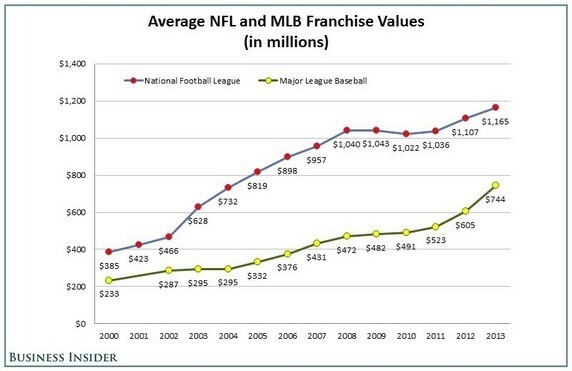 Ultimately though, generally speaking after all annual revenue is collected and all expenses are paid, sports franchises do not make a profit. However majority increase in value annually, hence even if a owner is not making a profit through advertising and sales, their net worth still increases. This fact can be seen in the graphic below. The Angels were able to sign Albert Pujols to a $254million, 10-year contract due to their just-completed regional cable deal for $3billion. Another example of both profit and increase in value can be seen in the New York Yankees whom have also been able to achieve record value and steady profits annually through massive television deals. But both profit and value are rare, as typically more valuable teams have far greater expenses. Not the answer you're looking for? Browse other questions tagged statistics finances international-sports or ask your own question.